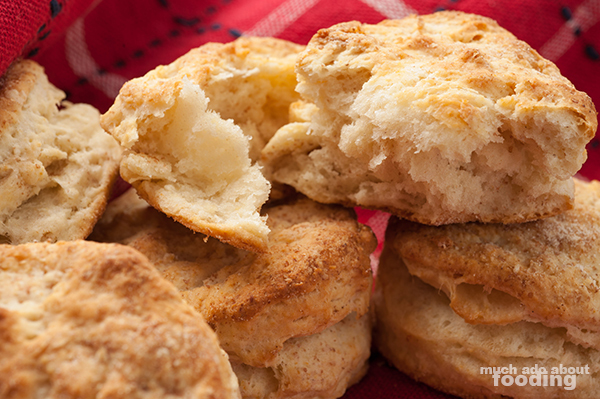 Do you need a reason to make biscuits at home? 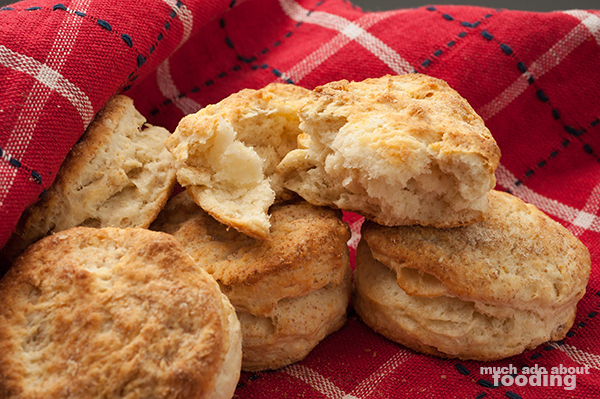 Biscuits should have a free pass when it comes to inclusion in a kitchen because they are just too good. Sop up some butter or honey with it...or have it with preserves for breakfast. What's interesting though is how easy it is to make once you consider how few ingredients one needs. Whenever I make biscuits, Duc eats way too many in a day so they never last long! Some people will use buttermilk but if you are like me and don't typically buy just one ingredient when you want to make something (yes, I'm lazy), you can combine milk with cream of tartar from your pantry. Also, I used whole wheat flour to dust and work with the dough instead of all-purpose to give a grittier texture on the outside; it's a preference thing. Let's get started. Preheat oven to 450°F. If you are using a pastry cutter, mix flour, baking powder, salt, and baking soda in a mixing bowl. If you are using a food processor, you can just dump all those above ingredients into its bowl. Cut in cold or even frozen butter into dry mix until everything looks like dry crumbs - be careful not to melt the butter with your hands. The colder it stays, the fluffier the biscuits. Mix milk with cream of tartar until dissolved (this is a buttermilk substitute but if using buttermilk, omit cream of tartar). Form a well in the dry mixture and mix in milk. The mixture will be very wet now. Place dough onto wheat-floured surface and flatten out. Fold five times until 1" thick. Cut into 2" rounds. Excess dough can be rolled up again to cut into more rounds but these won't be as fluffy as the first set. Bake 12-15 minutes until golden brown. Enjoy!